A new method called Diattenuation Imaging, which was developed by HBP scientists at Forschungszentrum Jülich in collaboration with the University of Groningen, reveals image contrasts between different tissue types of the brain and allows distinguishing regions with many thin nerve fibres from regions with few thick nerve fibres. The technique can be used in addition to other imaging modalities to learn more about the brain’s nerve fibre architecture and tissue composition, and to identify pathological changes. 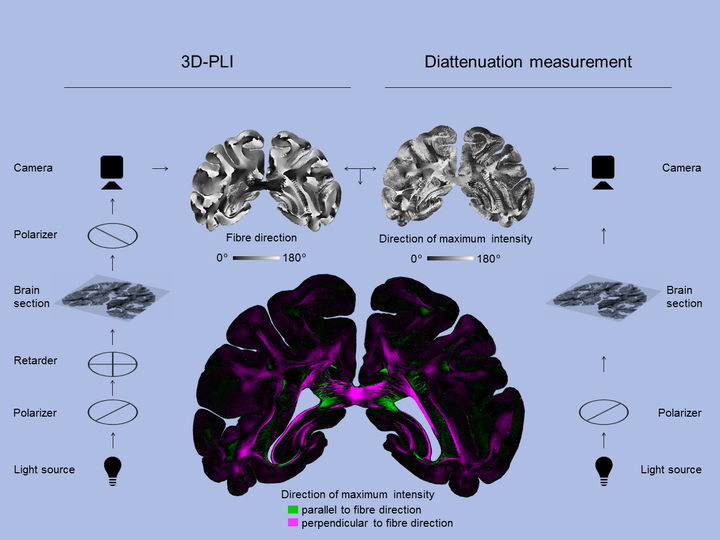 Diattenuation Imaging (DI) analyses thin histological brain sections in a special microscope that uses polarized light, i.e. a light wave with a certain direction of oscillation. The technique is an extension of the previously established method of 3D Polarized Light Imaging (3D-PLI), which measures the polarization-dependent refraction of light to derive the spatial orientations of the nerve fibres. The new technique combines the 3D-PLI measurement with a diattenuation measurement, which determines the polarization-dependent attenuation of light (diattenuation). The scientists found that in some regions, the brain tissue is maximally transparent when the polarization of light is oriented parallel to the nerve fibres. In other regions, the tissue is maximally transparent when the polarization is oriented perpendicularly to the nerve fibres. To study these effects in more detail, the researchers went on to model the propagation of the light wave through artificial nerve fibre configurations using simulations on the former Jülich supercomputer JUQUEEN. The simulations revealed that the observed effects do not only depend on the nerve fibre orientations and the time after embedding the brain sections, but also on other tissue properties like the fibre diameter or the thickness of the myelin sheaths, which surround many nerve fibres in the brain. 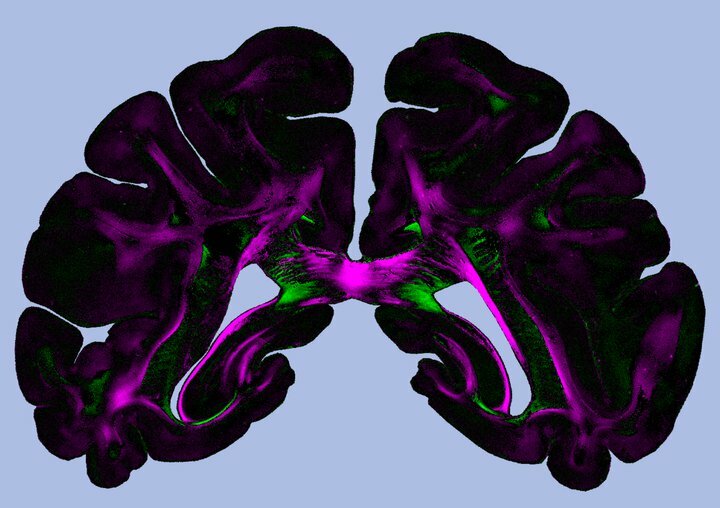 The high quality data from this and other areas of HBP’s experimental neuroscience work is being integrated into a multiscale, multimodal 3D model to construct the most comprehensive atlas of the human brain to date. Neuroscientists and supercomputing experts work together to handle the extremely large datasets generated by modern neuroscience methods, and are developing the pioneering technology and workflows for investigating the brain with High Performance Computing. The resulting atlas and analytics tools are available to researchers around the world through their web browser. The HBP atlas systems offer a way to integrate vast and heterogeneous neuroscience data into common frameworks and better understand the multilevel organization of the brain. A new video explains the key principles of HBP workflows used for registration of data into common reference atlases.